Formerly a Chief Scientist for the State of Victoria (Australia), Dr. Peter Coombes is a water advisor to all levels of governments in Australia. An outside-the-pipe thinker, he is pioneering applications of a “whole-systems approach” to urban, rural and natural water cycle management. His mission is to find optimum solutions for the sustainable use of ecosystem services, provision of infrastructure and urban planning. The work of Dr. Coombes is compelling in the ways his research and findings challenge conventional thinking. He is a peer advisor to the Partnership for Water Sustainability in British Columbia, with a working relationship that dates back to 2001. In an article published last month in one of the United Kingdom’s leading business and finance magazines, Dr. Coombes and his colleague Dr. Michael Barry warn that by continuing to use conventional top-down assessment techniques based on averages, we risk getting things dangerously wrong and not understanding why. A History of Missed Opportunities! Scientific breakthroughs by Peter Coombes and Michael Barry, which apply bottom-up systems thinking to the assessment and management of water resources, reveal the potential scale of miscalculation – and missed opportunities – occurring with traditional methods. “Although it has been the standard approach to water resource management for decades, top-down thinking based on averages is not fit for purpose in the face of rapidly ageing infrastructure, population growth, climate change, and increasing urbanisation, and it severely compromises our ability to understand, manage, and deliver essential water services,” they wrote. “Simply put, applying averages makes no conceptual sense – is there such a thing as an average household with 2.3 occupants, and a corresponding average water demand that is isolated from an urban system? If not, then how could we expect that using such an unreal thing in water resource analysis would produce real outcomes that can be relied upon? “Water regulators and suppliers must change their mind-sets now if they are to future-proof our natural resources for generations to come. In order to properly understand water resources and economic policy opportunities, they must reject traditional average-based engineering and economic assumptions in favour of holistic bottom-up analyses of the complex and competing demands of real urban and environmental systems. These approaches must be incorporated into the real feed-back loops in society and ecosystems. What is a systems approach and why is it imperative? “Developing a successful public policy for allocating scarce resources requires an understanding of the myriad trade-off decisions involved within the complex society that uses them. “All are linked from a system perspective, meaning that decisions in one area invariably impact others; yet the sector traditionally operates in siloes. “The financial viability of a utility or an item of infrastructure must be assessed in the context of its economic, ecological, and social impact. These benefits and costs will be cumulative and wide ranging, occurring throughout society and across many scales, from household and neighbourhood to city and nation. “Clear visibility of the big picture encourages support for strategies that would traditionally be dismissed as marginal that would actually benefit wider society and protects against schemes shown to impact negatively in unexpected areas. Government and utilities need to know how they are performing from a whole-of-society perspective and for future generations. The Systems Framework can supply the answers,” assert the authors. What’s wrong with traditional analysis? “Cities and regions are intensely complex systems featuring innumerable variations in behaviour which drive an intricate circular economy. This makes a nonsense of using global averages and linear processes to manage the allocation of scarce resources. It often provides an illusion of limited options for innovation in policy, strategy and implementation. “Failure to adopt a systems approach will condemn us to continuing down the path of inconsistent and inefficient management of our resources, harming this and future generations. “We cannot meet our obligations with a piecemeal approach to water, or any other resource, management. Only a holistic systems approach can deliver the required level of insight,” conclude the authors. 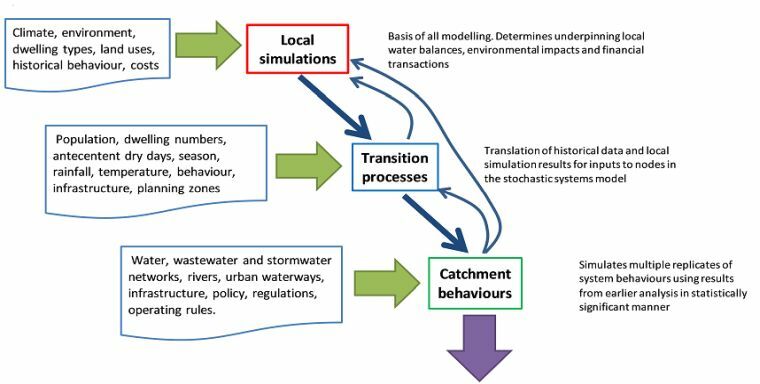 The Systems Framework was developed over the last 20 years of applied research and practical application to provide insight into policies and strategies for water cycle management, urban planning, environmental protection, energy uses and economics. The Framework utilises Big Data inputs and is built up from Local Scale behaviours to include Transition and Regional Scale layers. The Systems Framework is shown above. It is series of applications for continuous simulation that interact with each other to span all relevant spatial and temporal scales including household to city to national scales at timelines of one second to 50 years. The Framework includes a multiple replication framework of climate sequences and linked behavioural responses.